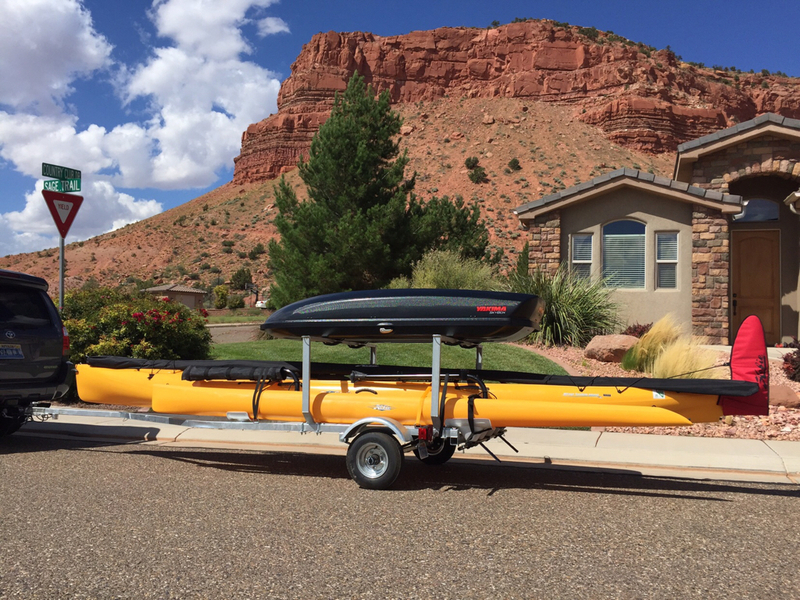 Hobie Forums • View topic - Got a pic of your trailer? Got a pic of your trailer? Post subject: Got a pic of your trailer? I am interested in seeing your trailer setup with gear, please. Bought a 4x8 harbor freight trailer, so 11.5 loa. About to add a tongue extension, I think about 3'? She is a TI, so I am looking at 4' overhang. 4' overhang shouldn't present any issues, right? Eventually, especially if we do a big trip we have had planned for years and especially bought the TI for, we want to add a utility shelf. 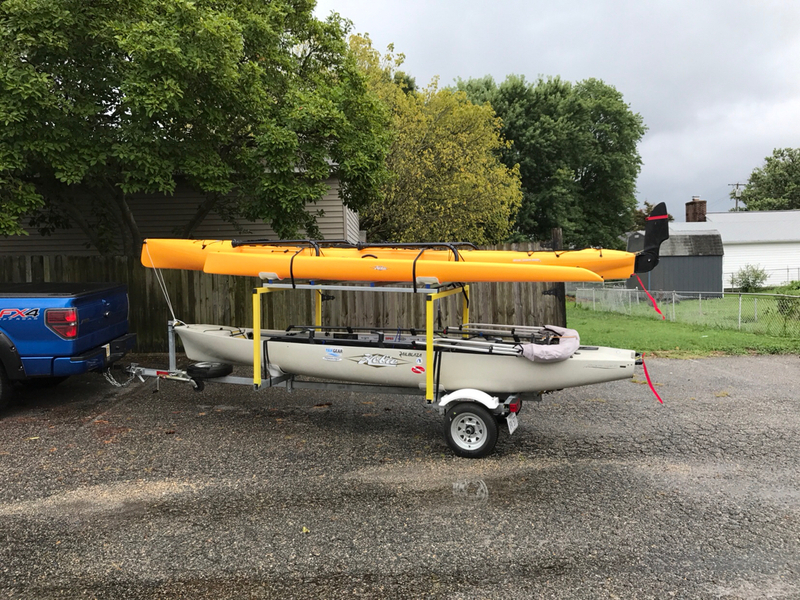 Not a utility trailer with kayak on top, but a version of the opposite. 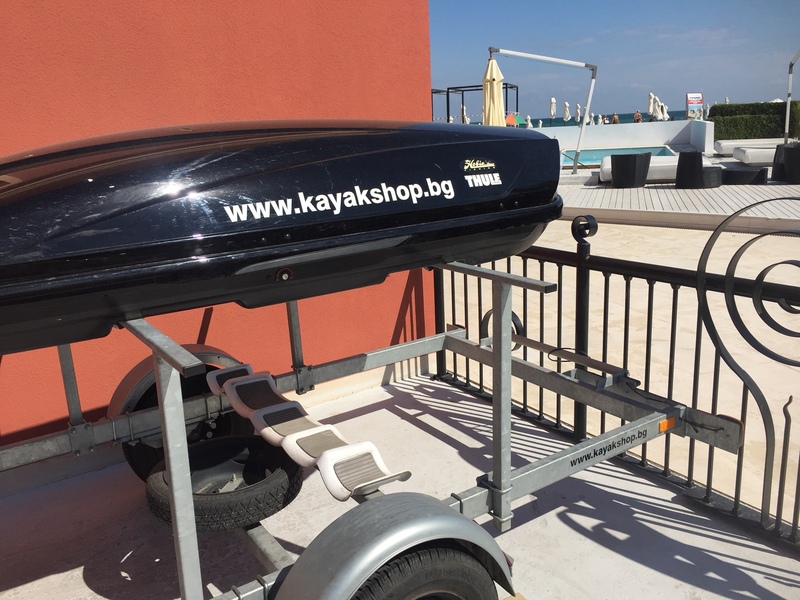 I have spent hours googling trailer images looking for kayak trailers with a utility box built above the kayak or a shelf over it to lash gear onto (such as a tent, camping table, chairs, water jerry cans) but nothing comes up. I am thinking my partner will build it about 4' wide and 4-6' long? I envision side rails mounted to the 4x8 frame and a wooden basket over that about 6"'s above the TI. Anybody seen something similar? Post subject: Re: Got a pic of your trailer? 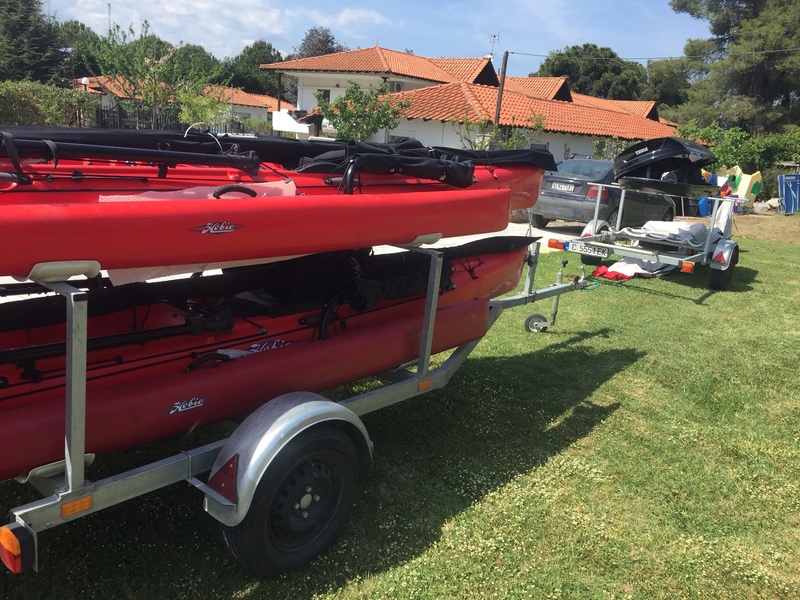 search for my post 'Hobie Island and Trailer setup'. The lakes i go to is just 20 min away from my house and not a busy road so this low quality HB freight trailer is good enough. i also do not submerge this trailer in saltwater to avoid rust. 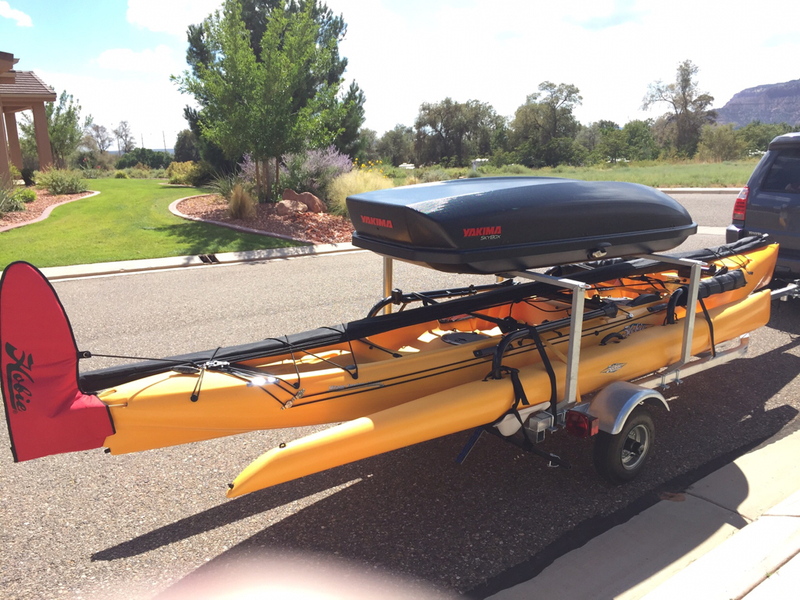 I assemble everything in the parking lot and use hobie cart to drag the kayak into the water. This is perfect for my own requirement as it allows me to bring hakas and outboard. Share your setup once completed. 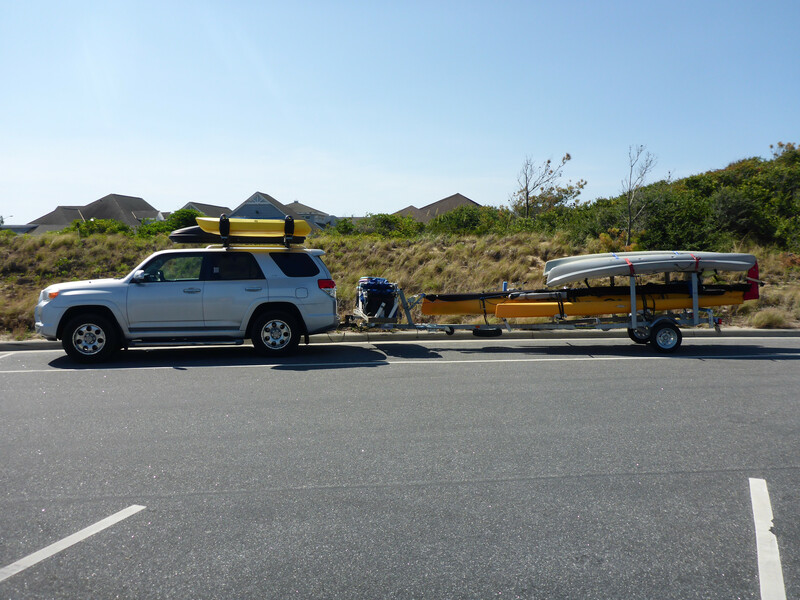 Pics of the evolution of my trailer with Thule cargo box overhead. 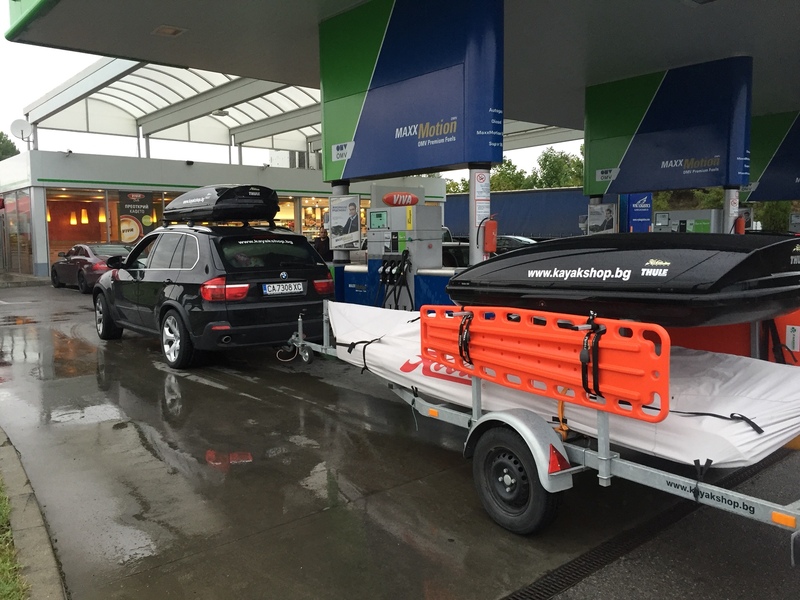 I like my trailer a lot but one down side is that the boat has to be removed from the trailer to rig the boat. This means that some kind of cart has to be used for launching and retrieval. I could launch the un-rigged boat directly from the trailer but after doing it once I realized that slogging around in the water to do all of the rigging was too difficult. 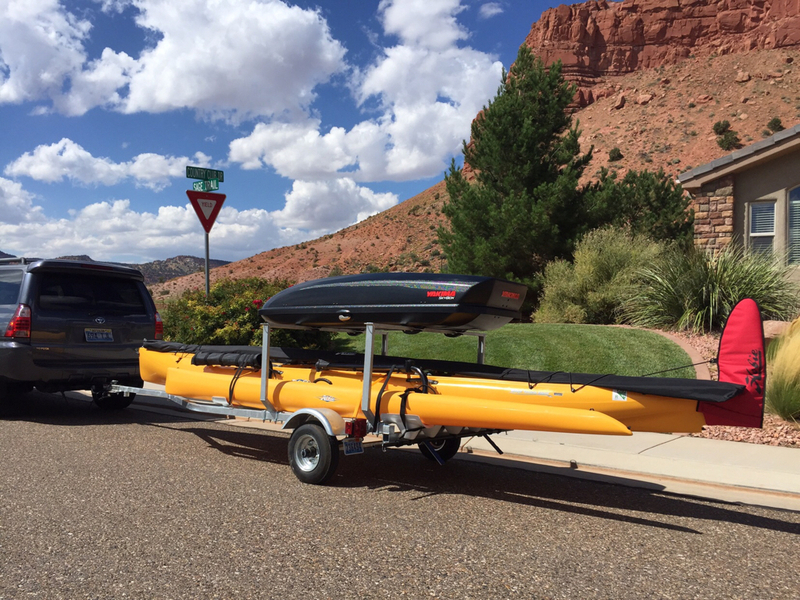 The cargo box however makes it very convenient to store all of the boat stuff. Since I use a scupper cart, the cart dictates how high the trailer has to be and how much lifting it takes to get the boat back on the trailer. There we go, nice job Chris! That is one of the few I have seen built for storage and not another yak on top. What do you mean you can't launch it rigged? I see you can't with the mast in, but why a cart? Personally, we have rigged many times while underway. Drop in a drive then pedal to open water away from traffic, unravel the tramps, buckle em in, step the mast from the tramp or aft cockpit and then running rigging, good to go. Of course it all can be done from the launch ramp dock too. Do you not have a dock at your launch? What I mean by can't rig on the trailer is that the aka's can't be extended because of the uprights for the storage box. This means that it has to be done on the ground or in the water. It's just a lot easier doing this walking around the boat rather than slogging through even shallow water, especially when it's windy and the boat isn't stationary. So once the boat is on the scupper cart off of the trailer I : Extend the akas, attach the tramps, tie the keep out lines for the amas, attach one or two hakas, bungee stuff like the cooler, floats, paddle to the haka(s),step and rig the mast, etc. 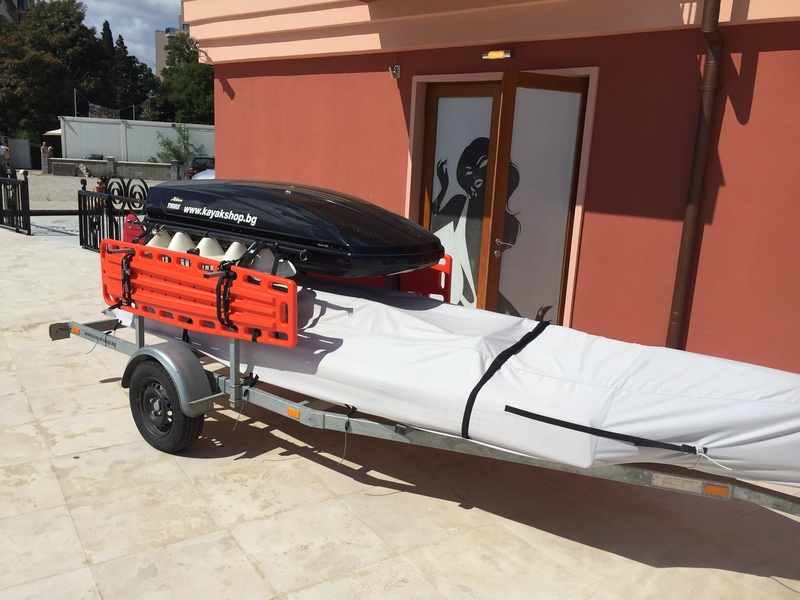 On the other hand it's very convenient loading a lot of the gear that goes on the hull directly to\from the cargo box while the boat is on the trailer : mirage drives, pfd's etc. But this does add to the weight that has to be lowered\raised when lifting the boat on or off the trailer. I have found that I need to lash the bow end of the amas together across the hull when loading the boat back on the trailer because they sometimes want to randomly splay out into or outside the rear uprights for the cargo box. I usually just use one of the ama keep out lines for this. As for cradles vs carpeted bunks vs pvc. This has been talked about a great deal on the forum. I went the pvc route because they are simple, maintenance free, work very well and will probably last forever. 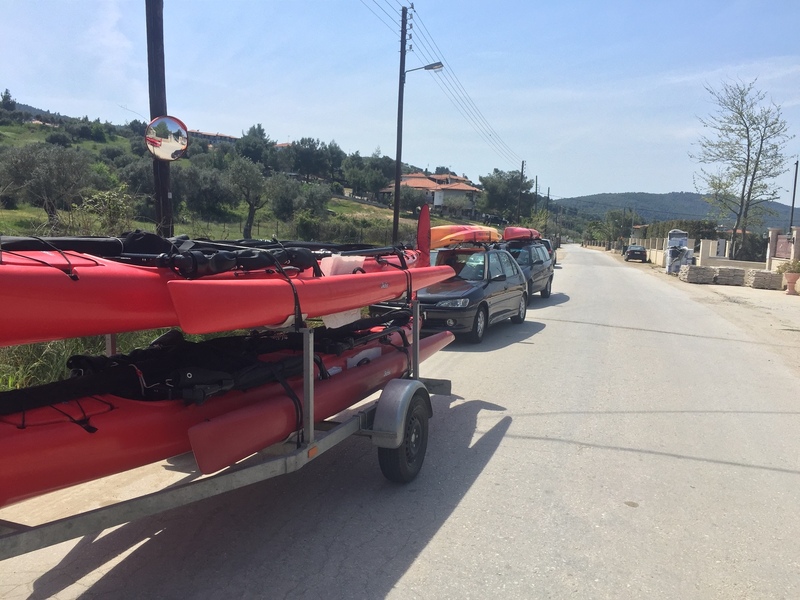 Mine happen to be adjustable also and it allows for the boat to be supported along most of it's length. I occasionally wipe them down with 303 aerospace protectant and the boat glides over them like butter. - Piece of extra carpet to soften the approach with the boat, overhanging the back edge. I have had a few. The top racks are nice but you cant rig it. Anyone build a box under their TI? This is my "fully loaded" setup. This is us traveling to OBX for a week, packed to the gills. On the trailer is my TI, an OK Scrambler, an Outback and a Plano fishing rod holder with about 8 rods in it. There is a dual hitch receiver with a large cooler, a tool box converted to giant tackle box, 2 beach chairs and 4 boogie boards. On the roof is a hullavator carrying a kids kayak and a Thule cargo box, loaded up with all kind of stuff, but most notably at Weber gas grill. 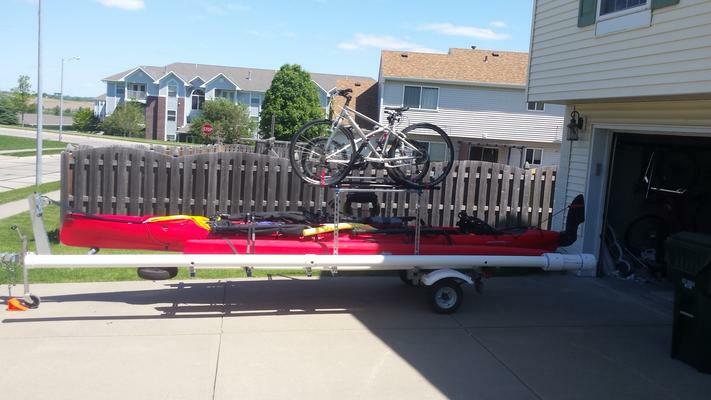 The trailer has a folding tongue so the whole things fits in my garage. Do you have any pictures? 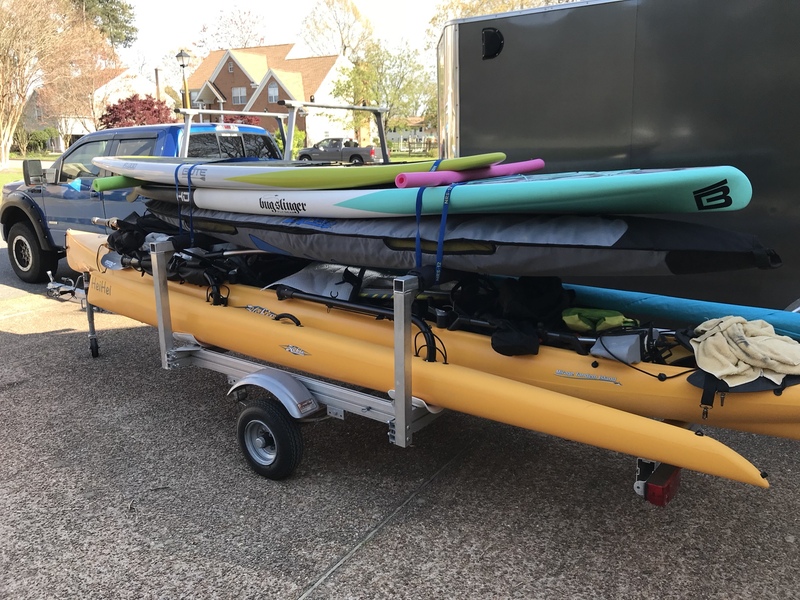 i am curious about the 2x6 cradles as one of my Hobie cradles cracked and I am not sure I want to invest in those again.